Save Birds and Meet Houston Zoo Wildlife Heroes at the Migratory Bird SOS Event on March 23rd! Did you know you can help protect birds from the comfort of your home by planting native plants or installing a bird feeder? Come to the Zoo this Saturday, March 23rd from 10am – 1:00pm for our Migratory Bird Spotlight on Species event to learn all about bird-friendly actions you can take! 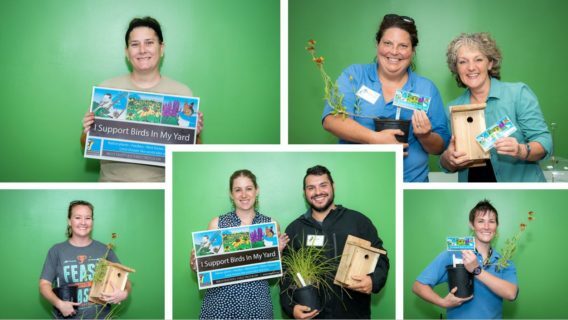 At the event you will have the opportunity to meet a number of staff members that have started their own bird-friendly backyard projects and even take a pledge to start your own wildlife saving journey! For the past year, Houston Audubon and the Houston Zoo teamed up to create easy steps to help Houstonians attract birds to their backyards, patios, or balconies. 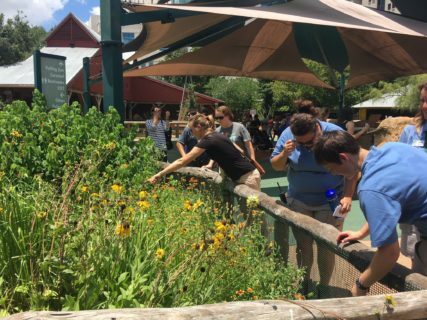 A group of 20 Zoo employees committed to taking bird-friendly actions at home for the duration of one year and met monthly during that time in an effort to uncover the problems people run into when attempting to create a bird-friendly spaces. 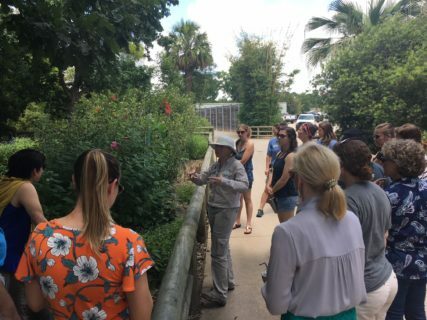 The challenges included the time it takes to plan and plant, where to purchase plants and feeders, and not knowing how to determine which plants are truly from Houston and supportive of wildlife. The team was very empowered by the fact that they could protect beautiful native and migratory bird species and loved that creating these spaces gave them the ability to connect family members and friends to nature at home. During their year-long commitment our staff members were able to plant 95 native plants and installed 14 bird feeders! We are so excited to invite our guests to join the bird-friendly community we have created and see what amazing things each of you are able to accomplish. The Houston Zoo has many bird-friendly gardens on grounds thanks to our talented horticulture team that provides safety and support for local wildlife through creating native plant gardens. Keep an eye out for these gardens on your way to the event this weekend which will take place at the Reflection Pool! And remember, just by visiting you are saving the wild counterparts of the animals you see through your Zoo admission and memberships. Share via Facebook: Save Birds and Meet Houston Zoo Wildlife Heroes at the Migratory Bird SOS Event on March 23rd! Share via Twitter: Save Birds and Meet Houston Zoo Wildlife Heroes at the Migratory Bird SOS Event on March 23rd! Share via Linkedin: Save Birds and Meet Houston Zoo Wildlife Heroes at the Migratory Bird SOS Event on March 23rd! Share via Email: Save Birds and Meet Houston Zoo Wildlife Heroes at the Migratory Bird SOS Event on March 23rd! Grab a Drink and Save Animals in the Wild at Brew at the Zoo on April 25th!